spend some time today checking out my wonderful sponsors! they don't disappoint. all of these items are going to one winner. and i am jealous of that person. to enter this giveaway leave a comment here. - head on over to sugar blossom boutique and let me know your favorite item. 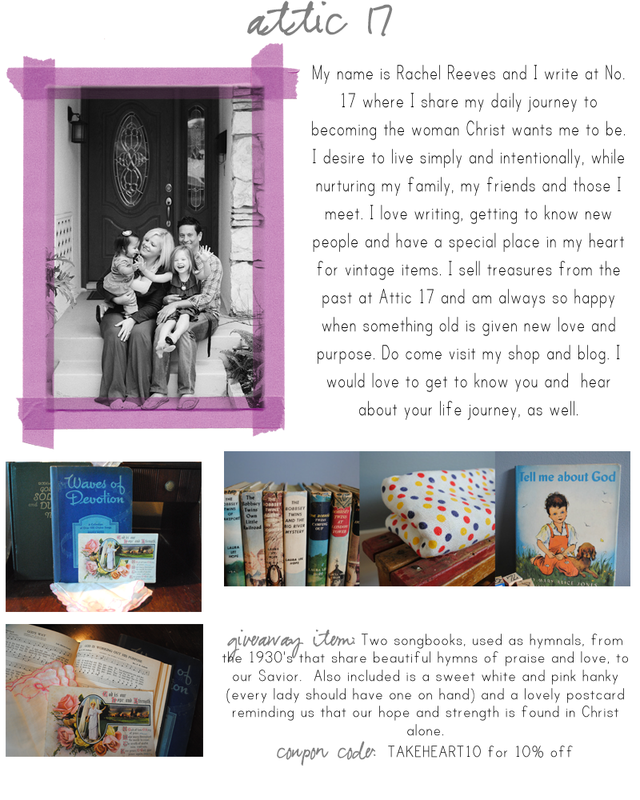 - head on over to attic 17 and let me know your favorite item. 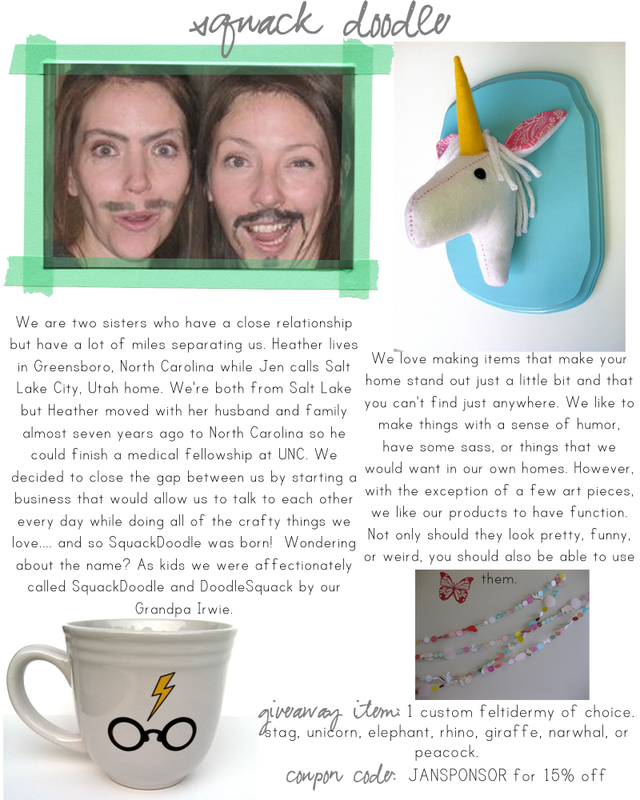 - head on over to squack doodle and let me know your favorite item. - head on over to art by erin leigh and let me know your favorite item. - head on over to sarah's pachyderm friends and let me know your favorite item. winner chosen by random.org and announced friday. oh, this is going to be sooooo much fun!!! I soooooo ADORE the Blossom Trio Headband - mustard grey cream, from Sugar Blossom Boutique. I love these colors together!! I think the Vintage Hand Crocheted Baby Mittens from Attic 17 is just darling! How sweet!! My boyfriend and I have a pretty rustic apartment with a little bit of charm thrown in and I think that the Sweetheart tree carving clock from squackdoodle is just that! How charming! I am just in AWE over the work that erin leigh does. I just love all of her pieces of work, especially the Inspirational Quote, BE THE CHANGE (Ghandi), 8x10 print. This reminds me of a church camp from a few years ago that I was on staff for and the incredible experience that was received. In addition, this is one of my very favorite quotes!! Elephants are just so cute to begin with but if you add in the fabric and the love that you can see behind each one of these pachyderms, it just makes them so much more cuter!! My three favorites are Sydney, Franny and Lucy! I adore that each one of them have a story. OMG! I just found the elephant sets from sarah's pachyderms friends and I just LOVE, LOVE, LOVE the Tiny Stuffed Couple Elephants- Mr. and Mrs. Ivory. Perfect for a wedding that I will be attending this year!! I, Jessica @ pancakes & bubblegum, is now following Danielle's very fun blog!! So excited to follow her!! i "like" sugar blossom on facebook!! I "like" squackdoodle on facebook!! I'm now following erin's blog!!! soooo pumped, her gift is sooooo amazing!!! i "like" sarah's pachyderm friends on facebook!! i always look forward to your giveaways! the Sweet Cream flower headband is my favorite item for sure. i looooooooove the Retro Square 40 inch polka dot tablecloth from attic17. the harry potter mug is my favorite from squackdoodle. the Inspirational Art ( Promise Me Youll Always Remember Birds in pink, A.A. Milne, 8 x 10 Fine Art Print) is my fav of erin's. i love the teal elephant of sarah's. and now following erin's blog. I love Sugar Blossoms Multi-colored Boho Headband in the Mustard Yellow. I liked Sugar Blossom on Facebook. I love the set of pyrex dishes at Attic17..perfect addition to my collection! I love the mounted felt stag at Sqackdoodle. So cute! The little pink Lucy elephant at Sara's is my favorite! "The Joy of the Lord is my Strength" print at Erins would look great in my girls room. I am a new follower of Erins blog. I liked Squackdoodle on Facebook. I am a new follower of Danielle's blog. I am a follower of the blog. Fantastic shops! I love the sweet cream flower headband at Sugar Blossom Boutique! I love the polka dot tablecloth at Attic 17! I NEED that unicorn! OMG! I like the "The More We Get Together" print at Erin's shop. I love the sydney elephant at Sarah's pachyderm friends. I like Sugar Blossom Boutique on FB. I like Squack Doddle on Facebook. I like Sarah's Pachyderm Friends on FB! I am in love in love with the felt taxidermy. I'm really having a hard time deciding between the moose (since we have a moose thing going on in our office) or the really darling unicorn. Thanks for the chance to win Danielle! fanTASTIC giveaway! love them all. that mounted stag is incredible and i just my die if i win this. no joke. i really like all of the books at attic 17.
i liked the franny elephant. pretty cute. Great giveaway! would love to win! I love the hues of autumn headband in orange, yellow and burlap. SO cute! I love the Inspirational Art...Promise me you'll always remember, by Erin Leigh. Have I told you how much I LOVE sponsor giveaway day? I love the trio of autumn headband from sugar blossom boutique. totally adorable giveaway! thanks, danielle! Love the firetruck book from attic 17. This giveaway is aaaamazing :) and you're pretty great too! I LOVE the trio of autumn headband from sugar blossom! The delight in the Lord scripture art in perfect! Pick me pick me! My daughter lost her BoHo headband and is :( over it. Oooh pick me pick me! This is such a cool giveaway! Eek! I wanna win! 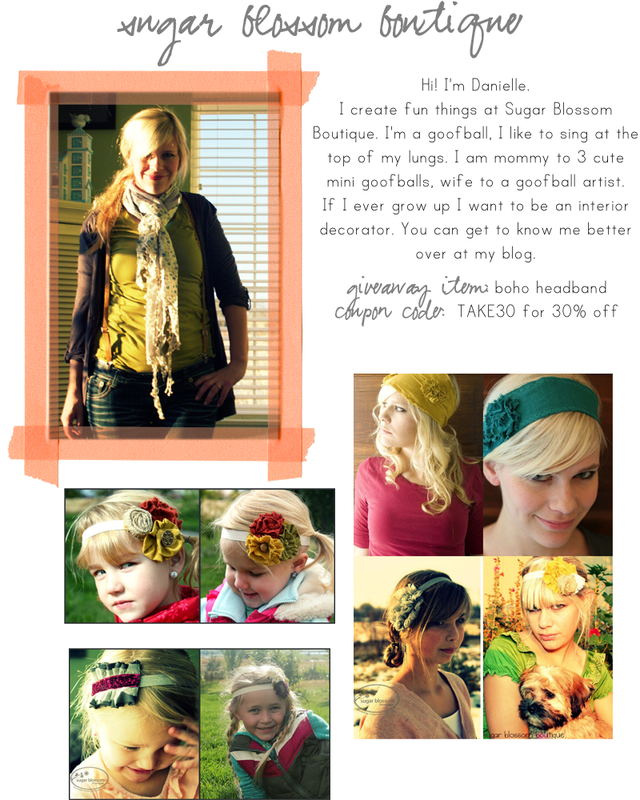 I love the Rock Climber headband at Sugar Blossom Boutique. In Love with the Pyrex Homestead Bowls at Attic 17! Love the Birds on a Wire Key Hanger at Squackadoodle! Love! I need the Press on Brave Soul scripture art by Erin Leigh! The Sydney Stuffed Elephant is so cute and I can totally see him sitting on my nightstand! I am following Sugar Blossom on FB! I am following Attic 17 on FB! 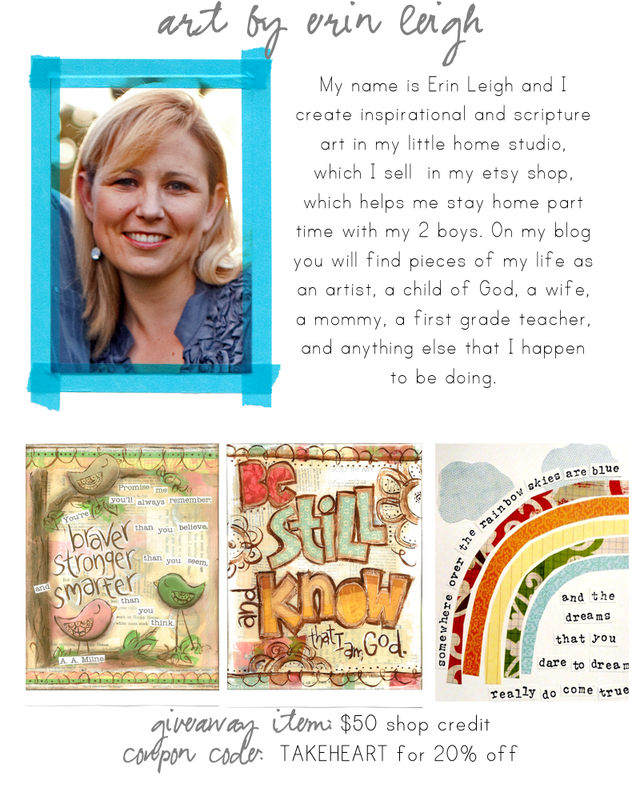 I am following Erin's Blog! I am following Squack Doodle on FB! 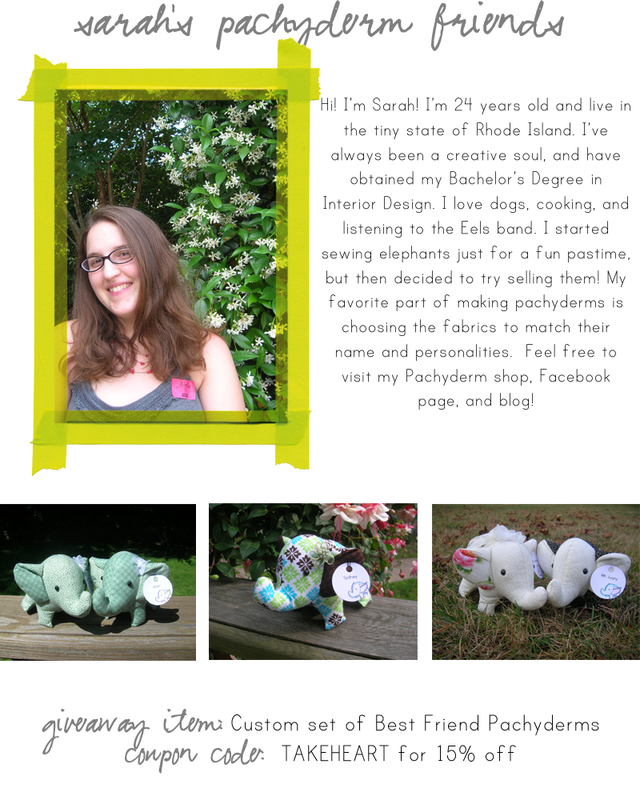 I am following Sarah's pachyderm friends on FB! OHHHH they all have such beautiful things!! I love the talent God gives us all! my favorite thing from sugar blossom boutique is the mustard yellow boho headband! my fave from attic 17 is the tea napkins! my fave from squackdoodle is the unicorn taxidermy! That is WAY too cute! my fave from Erin Leigh is the Abide in Me art! my favorite from sarah's pachyderm friends is Sukie the yellow elephant! What amazing sponsors! Thanks for the opportunity to win. Sugar Blossom fav. Boho Headband!!!! fav. at attic 17 are the bowls!! fav. at squawk doodle is the he loves me/not mug!! fav. item from sarah's pachyderm is "FRANNY"!! I love the Set of two EMALOX bowls from Norway from Attic17. I adore the Mr. Tea mug from squackdoodle! The Inspirational Scripture Art, Sometimes God Has Bigger Plans for Us, 8x10 Fine Art Print from artbyerinleigh is gorgeous. I'm going to have to get the Tiny Stuffed Best Friends Elephants- Trudy and Judy from sarah's pachyderm friends. I like Squackdoodle on FB. I follow Art by Erin Leigh. I liked No. 17 Cherry Tree Lane on FB. love the impromptu china dish in rachel's shop! love erin's "God has bigger plans for us..." print. LOVE. the tiny stuffed "jane" elephant with the bow? i mean, seriously cute. love the "i heart rain" mug at squack doodle! sugar blossom's boho headband in eggplant, for sure. I love the large boho headbands at Sugar Blossom. All of her stuff is adorable, but there's something a little different about the boho headbands that I really like! The Mad Men red leather clutch at Attic17 is amazing!! The 'He loves me, he loves me not' mug at SquackDoodle is totally adorable!! I also love the 'I love rain' mug. Falling hearts? So cute!! The 'May you live all the days of your life' inspirational art piece by Art by Erin Leigh is amazing. I love the sentiment!! I already follow Danielle's blog. I 'liked' Sugar Blossom Boutique on Facebook. I 'liked' Squackdoodle on Facebook. I 'liked' Sarah's Pachyderm Friends on Facebook. And I 'liked' No. 17 Cherry Tree Lane on Facebook. from sugar blossoms I love the hues of autumn headband. from sugar blossoms i love the hues of autumn headband! from attic 17 the Snow White and Rose Red HardCover Book 1967... awesome!! from attic 17 the Snow White and Rose Red HardCover Book 1967...awesome! from squackdoodle i love the harry potter mug!! my sister in law would love that!! love the Tiny Stuffed Elephant- Franny from sarah's pachyderm friends. What a great giveaway bunch! I'll have to check them all out! Thanks for the chance to win some of their items! I LOVE the Mustard Yellow Boho Headband from Sugar Blossom! Loving the Emalox bowls from Attic17! I can't even choose my favorite art by erin leigh. It's all so lovely. The Lucy elephant is adorable from Pachyderm Friends. I MUST HAVE the mounted stag taxidermy from Squack Doodle. It's so fun and whimsical! I'm loving the Charcoal Skinny Boho Headband from Sugar Blossom. Sugar Blossom - I like the walk thru the woods headband. Attic17 - lovin' the pyrex bowls. Squack doodle - I love the giraffe taxidermy - it goes with my son's bedroom. Erin leigh - Love the Eph 3:18! I love the narwhal idea, such a unique animal!